Fuchsias are one of the most versatile of garden plants, their iconic flower colours and shapes colouring our Summer gardens for generations. 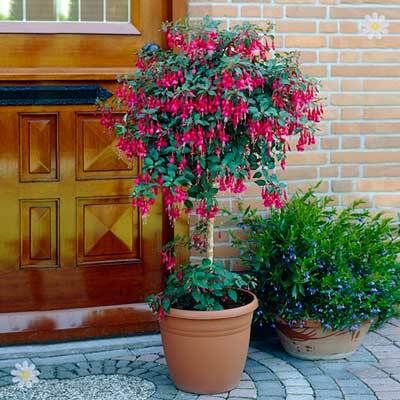 One of the most spectacular formats is the tall Fuchsia Standard (or Fuchsia tree as some like to call it), where a tall stem has been skilfully grown over the last year, and the head formed on top. Here we offer you a lovely pair in flower and bud that will add instant impact and colour to your garden or patio from now til the first frosts of Winter. With care and a frost protected greenhouse, they will over-Winter as well. Grow on in large pots on the patio or plant out into beds, in full sun locations – feed well to keep flowers coming.